In Marble Arena 2 the indie developers take the concept of the first game – inspired by the classic Marble Madness – to another level. 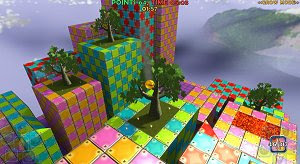 The beautiful 3D mazes of the game can be explored in single player or multiplayer, with the goal being that of collecting stars to reach the next level. Although seemingly simple, the task quickly becomes arduous but at the same time addictive and fun. With 50 arenas to complete, many power-ups and different types of ground to cover, Marble Arena 2 will be a good challenge for players with nerves of steel. The great presentation, with a level of detail that could put to shame some retail games, and the easy to use level editor are the icing on this delicious and succulent cake. Besides running on Windows PCs, Marble Arena 2 also has versions for Mac and Linux.